My family loves to grill, but nobody wants to clean up afterwards. It doesn't matter if we're camping or grilling at home on the deck. Everyone finds something better to do, and the chore falls to me! I wanted to find a grill brush that would make short work of the mess. It also had to be durable and safe to use. I ordered a few brushes and started experimenting with the grills I own to see which one would be the best grill brush. What Are The Best Grill Brushes For Barbecue Lovers? I'm happy to spend a little more if a product will do what it claims and last for a long time. That's why I didn't just head to the store and pick up a generic scrubber. I wanted something that was built for grills, designed to get into those tricky places and built to last. Here's what I was looking for in my perfect new grill brush. 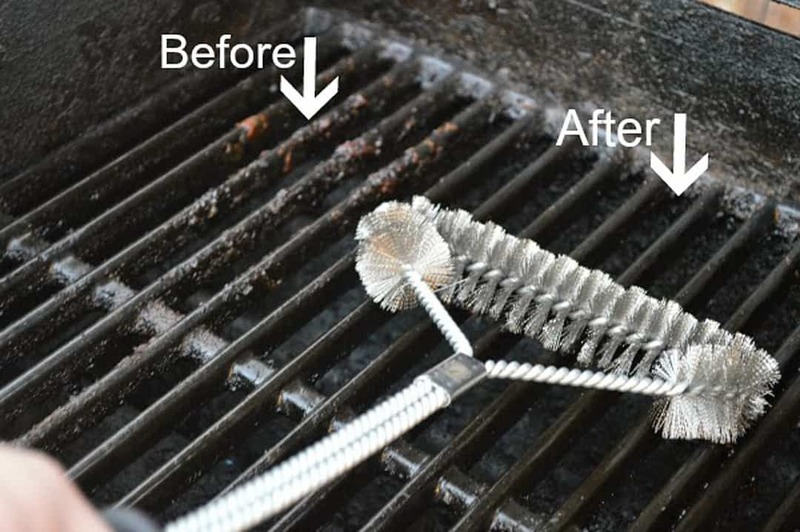 Cleaning your grill isn't quite as simple as hosing it down. I discovered that heavy-duty tools are necessary when you're dealing with barbecue sauce, fat and juices that have been heated up to more than 350 degrees. I was thrilled to find so many brushes with multiple heads on them. The great thing about the larger cleaning surface is that you can make short work out of your cleanup. Unlike a sponge, the smaller bristles on a quality brush can slip down between the grates. Overall, the bristles should be long enough to dip through and around the wire racks, but they should be short enough that the brush won't get bogged down by the cross pieces. One tip is to use a brush with a long handle so that you can clean off the grill while it's still hot. If you try to scrub down a hot grill with a short handle brush, you're going to start feeling uncomfortable very quickly. I prefer brushes that have an 18-inch handle so that I can safely scrub without waiting for the grill to cool. Be sure to check the labeling of your brush carefully; several brushes that are 18 inches in overall length, but this includes the scrubbing heads, so you're still getting close to the heat. The last thing you want is for bristles to break off in the area where you'll cook food later. Check your brush before using it to be sure that it's still in good condition, and then thoroughly rinse the grill afterwards to be sure that all residue is removed. When I was looking for brushes, I searched for quality manufacturers and durable designs to ensure that the bristles would stay in place. Old square brushes are fine for larger, square grills, but they won't work as well on your cylindrical infrared cleaner. I wanted to clean out my turkey fryer, so that meant finding a long, thin scrubber that could handle the curves. There really is no right or wrong answer when it comes to the shape. It all just depends on what type of grill you're going to use it on. However, you should take the time to consider your needs so that you can get the right shape and size. I've tried using small brushes on big grills, and it take forever to clean. Likewise, I cannot take my big scrubber out camping because it's too awkward to use with my smaller camping grill. Even with the right tools, cleaning the grill can be tedious. I've been tempted to use harsh chemicals to cut through the grime, but I learned from my neighbor's mistake. He used oven cleaner in his grill and failed to get all the residue out. The next time he cooked, you could smell and taste some of that chemical. You should avoid lining your grills with foil. While this makes cleanup easier, the fact is that modern grills aren't built to have heat trapped around the burners. It can actually damage the burners permanently. The easiest way to tackle burnt-on food in the grill is with heat. Turn on that burner and let it steam out the water. You only need to let it heat up enough to coat the interior with a nice layer of warm steam before you turn it off and start scrubbing. With this method, you'll only use water and your grill brush, and you'll be left with a sparkling clean cooking surface. Another triple-head cleaner, this grill brush was so easy to use. I decided to really put this one to the test by pulling out an infrared grill that needed some extra attention. The vertical positioning of the brush heads made it easy to clean the cylinder, and it didn't scratch the stainless steel interior at all, much to my satisfaction. 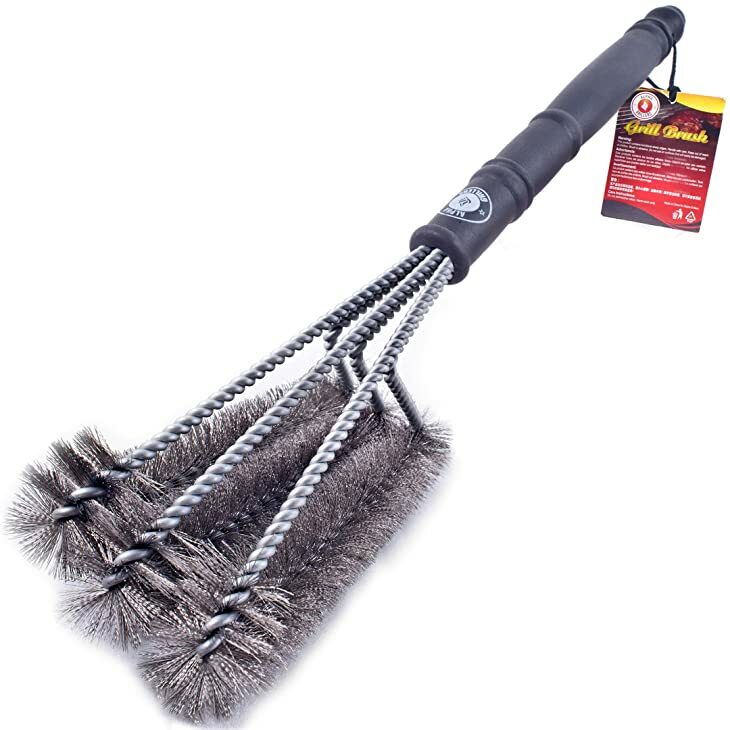 I was pleased to see that this brush has six shafts of wire enclosed in a durable plastic handle, so it didn't bend or break despite how hard I was pushing on it as I scrubbed the grease and food particles off my grill. The brush has a long handle, making it ideal to use on a warm grill, but I successfully cleaned a cold surface with it. Even the baked-in grease was no problem for this easy-to-use brush. The one-year, 100 percent money-back guarantee gives you peace of mind when purchasing. The included tip sheet provides you with handy advice for superior cleaning. 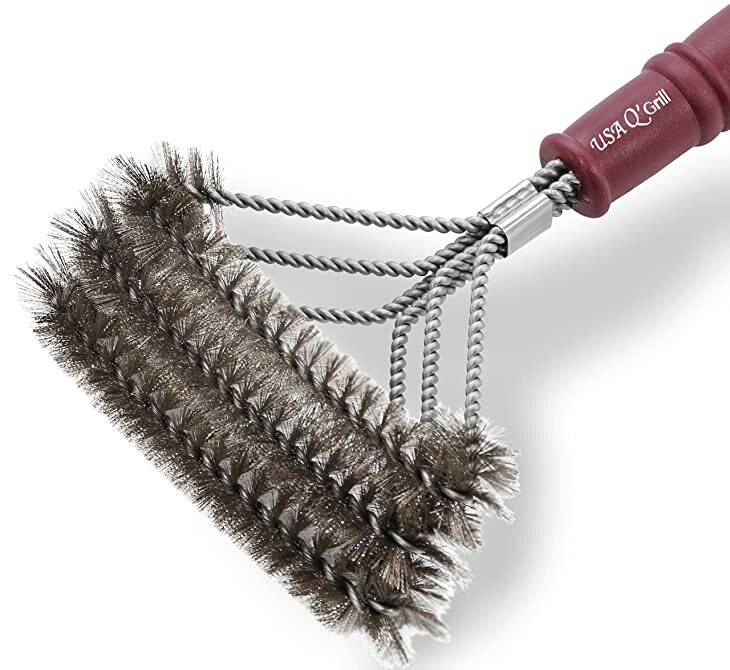 The brushes are specifically oriented to glide in between the grates of almost any grill. The larger size may not work well with some smaller grills. This brush is described by the manufacturer as one of the toughest around, and I would agree with that assessment. It's three brushes in one, so you get three times the cleaning for a sparkling grill. It has a specially enhanced handle that's made with state-of-the-art polymers for greater durability. Designed for use on all types of grills, I decided to test this one out on my charcoal grill that we take camping. It made the cleanup so easy that my 10-year-old was able to help me. My one complaint was that the handle's a little short, so I had to wait longer for the grill to cool down before I could start cleaning. It's advertised as being 18 inches long, but that's the overall dimension, so the handle is substantially shorter than that. The smaller size allows it to get into more nooks and crannies. It's designed to clean with just water, so you can avoid the use of chemicals. The brushes are diagonally placed so that they can reach in between the grates better. The brush should be dried immediately after cleaning it to prevent rust. 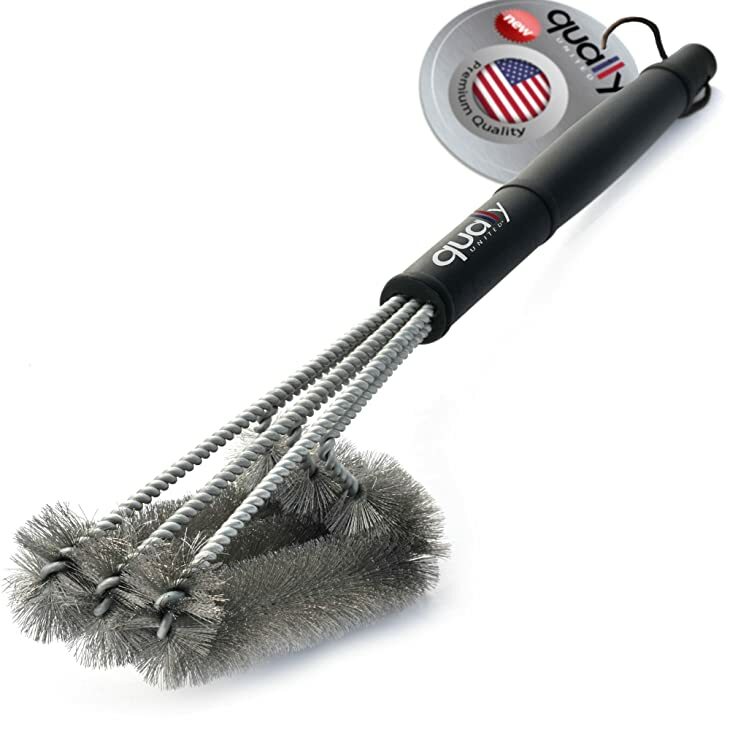 A durable and effective brush, this clever tool is truly made to get in between the wires on your grill and clear out the baked-on food. I loved the effortless cleaning, and the long handle helped me safely clean the grill while it was still a little warm. I love that I can feel the quality construction of this brush. It's made with stainless steel and is topped with a plastic handle that's comfortable to grip. I was skeptical when other people said that it saved 75 percent of their cleaning time, but I had the same experience. I cleaned both grills and the burners in record time. It took me a little experimenting to get into the corners with the larger head, but that won't be a problem in the future now that I know exactly how to work it. Three rows of brushes provide you with superior cleaning capabilities. 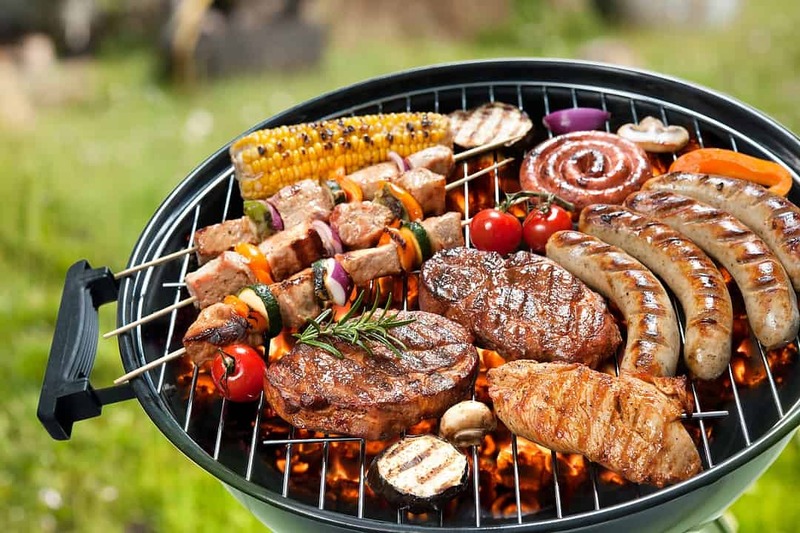 You can use this versatile tool on gas, charcoal, porcelain, infrared and even smoker grills. The woven steel wire won't scratch surfaces. The large size can make it a little tricky to work in tight spaces. Storage can be a little tricky due to the larger size. If you have baked-on messes from previous grill sessions that need to be scraped away, a more traditional brush might suit your needs nicely. I picked up this brush and decided to use it after my family cooked a few racks of ribs on the grill, leaving quite a sticky mess of sauce.The scraper of this brush is easy to use, and the long handle means that you can stay away from the heat. However, you still need to let the grill cool down a little more to avoid damaging the bristles. I noticed some of mind started to scorch when I rushed to clean up the residual pork and barbecue sauce. However, it worked beautifully when I gave the grill a few minutes to cool off before attempting to finish the cleaning job. The hanger hook allows for easy storage near your outdoor grilling space. It has 100 tufts of 3/4-inch brass wire that will not rust. 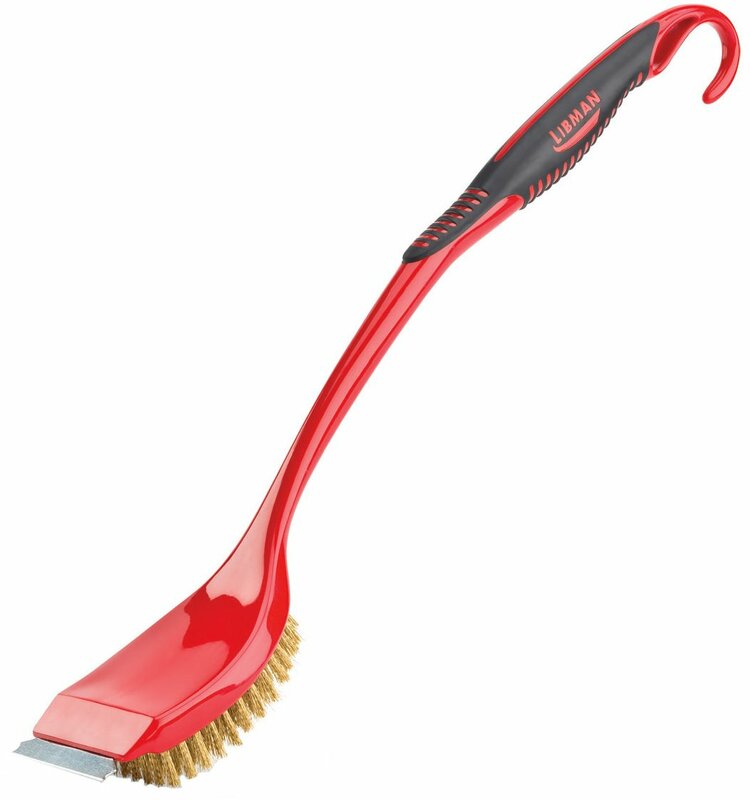 The brush is ergonomically designed with a special comfort handle. The bristles aren't quite stiff enough for some tougher jobs. The square shape isn't conducive to cleaning cylindrical infrared grills. There are times when you just need more leverage to deliver additional elbow grease, and I found that this was the top brush for those special occasions. 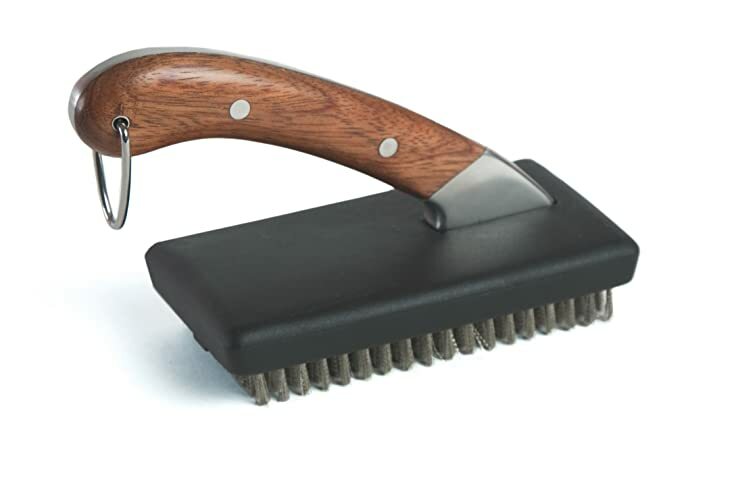 Designed with a contoured rosewood handle, this simple brush was able to tackle all types of food and grease. I borrowed a neighbor's grill that hadn't been cleaned in a year, and we were both impressed with how well this brush cleaned off the caked-on grease, food particles and other gunk that had been sitting for months. The one issue with this brush is the short handle. It's definitely not one you'll use on a hot grill, but I was able to work on a warm surface with it. The short handle can even be a benefit because it lets you leverage the tool better to clean those really tough spots. It's very durable and easy to use. The black plastic head with stainless steel bristles can be replaced. The densely packed bristles provide superior scrubbing action. The angled handle is specifically designed for comfort and control while exerting pressure. The short handle means that you must let the grill cool down. As far as I'm concerned, the clear winner is the Alpha Grillers. I truly could not find anything bad about this design. 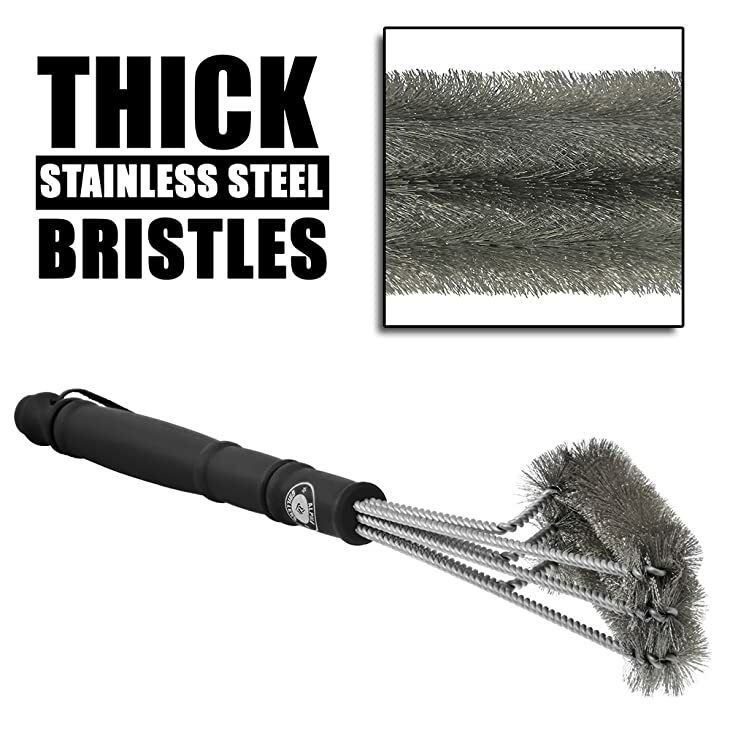 It's easy to use, has a nice, long handle, and has three rows of vertical brushes that can slip around a flat burner or curve with a cylindrical wall. It's easy to use, very affordable and backed with a one-year guarantee. I love everything about it, and it's been my go-to brush for all of my home grills. If you've tried any of these products or have another one that I should consider, please leave a comment! Please also share this article if you found it to be useful and enjoyed reading my product reviews. Hi Paula – I just came across your links and would love for my product/s to appear here. I have a brush that is much like those above and just arrived in December. I also have a BBQ tools set that. You can have a look at both on my website – both are for sale on Amazon. Do let me know if you could include these. Thank you very much.